At Brighton Smiles, we deliver leading dental care to keep you smiling! Ours is a dental practice that makes you our top priority. 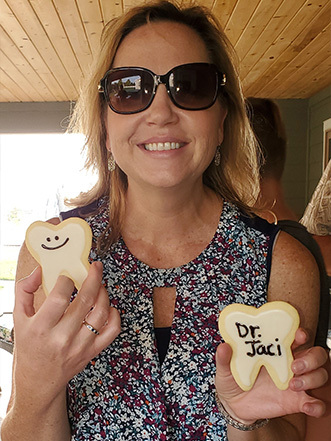 Dr. Jaclynn Spencer and our team will form a partnership with you, working toward the shared goal of a lifetime of healthy smiles for you and your family. We’re attentive listeners and look forward to learning about your life. We’ll spend a lot of time asking about your dental goals and any concerns you might have. The better she understands your desires, the better Dr. Spencer can develop a care approach that meets your clinical and personal needs. Supportive Environment: We’ve been serving our community for almost 15 years and take pride our positive, welcoming atmosphere. You’ll be surrounded with laughter, warmth, and smiles during your visits. Sharing stories, finding common interests, and learning from our patients keeps us enthused and our patients respond to that. You’ll feel safe and relaxed while here. If there’s ever anything you need, don’t hesitate to ask! Communication: Dr. Spencer and our team members will strive, starting with your first visit, to establish open communication. We’re not here to judge, only to help. We want you to be honest and direct with us, so we can better meet your needs. We’ll always be responsive, honest, and compassionate. Patient Education: Our goal is to help you take control of your smile’s health. That starts with education: we want you to understand the connection between oral health and overall body wellness. We’ll teach you about your unique dental issues and the steps you can take to improve your home care. We’ll also talk about healthy eating and encourage you to develop good habits. Keeping your teeth strong and healthy is essential and we’ll empower you to do so! Advanced Technology: Brighton Smiles is equipped with advanced dental technology, including digital X-rays and CAD/CAM. These offer the most accurate diagnostics, comfortable care, and strongest results. Leading-Edge Techniques: Today’s dentistry offers many treatment options that are painless, efficient, and will help you achieve and maintain your best smile. Continuing Professional Education: We are committed to staying current on developments in dentistry. By participating in continuing dental education, each of us keeps abreast of changes and how those improvements can improve your visits. We’re constantly expanding our knowledge and the treatment options we offer! Contact our Brighton, CO family and cosmetic dental office and schedule a visit for yourself or a loved one. We can’t wait get to know you while helping you develop great oral health for a lifetime of amazing smiles. Please, call today!